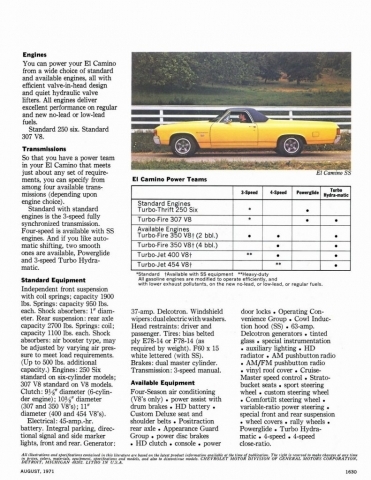 The 1972 El Camino received minor changes from the previous model year. The front of the 1972 El Camino was redesigned with one piece corner lights replacing the double stacking lights. The grille was changed as well as the grille moldings. The bowtie emblem was replaced by a Chevelle emblem at the lower driver side corner of the front grille. Base power was had by a six cylinder engine but, for the buyers who wanted more power could opt for a V-8. 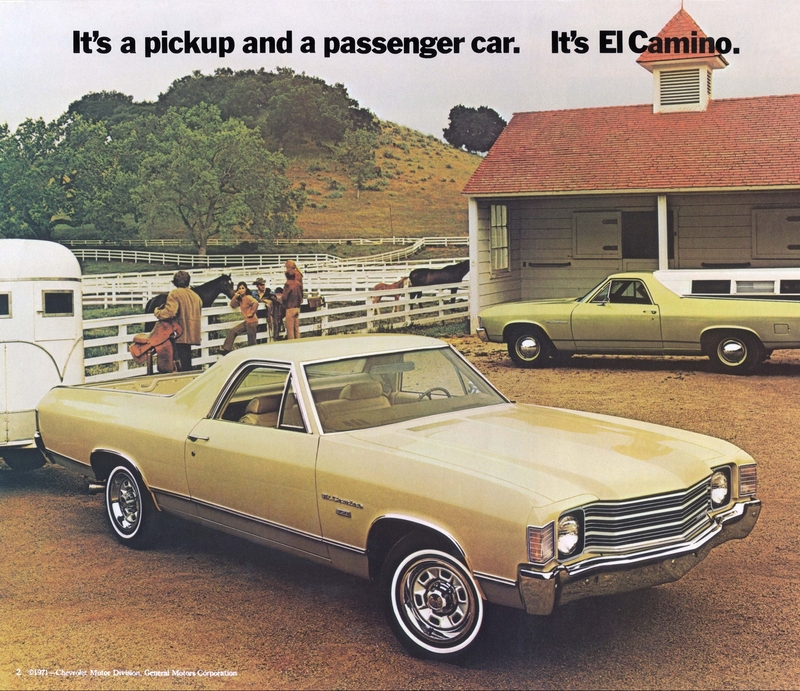 About 57,000 1971 Chevrolet El Caminos were produced. 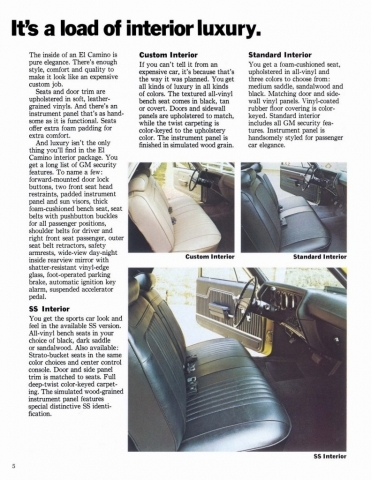 The 1972 El Camino trim was available in three levels including the base model El Camino, the El Camino Custom, and the El Camino SS. The 1972 El Camino base model featured bright windshield moldings and reverse lights on the tailgate. The 1972 El Camino Customs were only available with a V8 engine. They also featured the bright window moldings and reverse lights on the tail gate like the base model. However, the 1972 El Camino Customs featured body side moldings, wheel house moldings, bed moldings, tailgate moldings, and a silver anodized lower body finish. 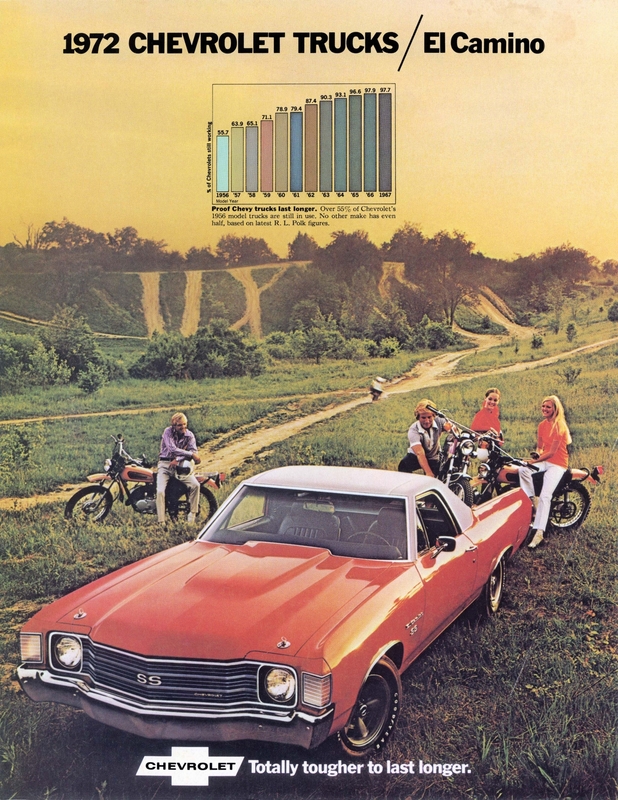 The 1972 Chevelle Super Sport option was available on everything but 307 models. 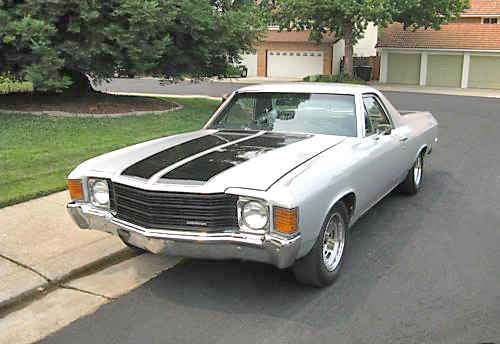 The basic Super Sport option featured a blacked out grille, a domed hood or cowl induction hood with pins, specially styled wheels, round instrument gauges, heavy duty suspension, power front disc brakes, and 15 x 7 inch wheels. 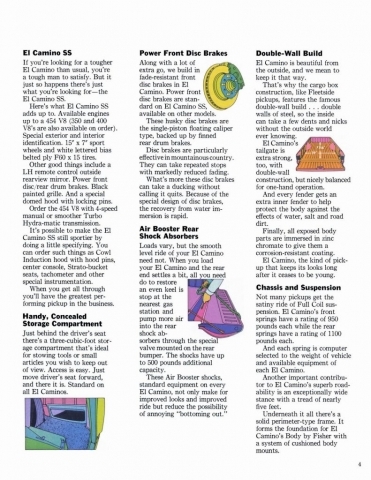 In 1972 the El Camino had a number of different exterior colors available for the buyer to chose from. Exterior colors included Antique White, Pewter Silver, Dusk Gray Poly, Tuxedo Black, Ascot Blue Poly, Mediterranean Blue Poly, Spring Green Poly, Gulf Green Poly, Oasis Green Poly, Sequoia Green Poly, Covert Tan, Placer Gold Poly, Desert Cold Poly, Cream Yellow, Golden Brown Poly, Turin Tan, Driftwood, Mohave Gold Poly, Orange Flame Poly, Midnight Bronze Poly, Aegean Brown, and Cranberry Red. Vinyl tops were available in white, black, blue, green, and tan.